The initiative aims to break many misconceptions pertaining to parenting and will be an open platform for parents to discuss any of their doubts and queries. The first event will be conducted on November 11. 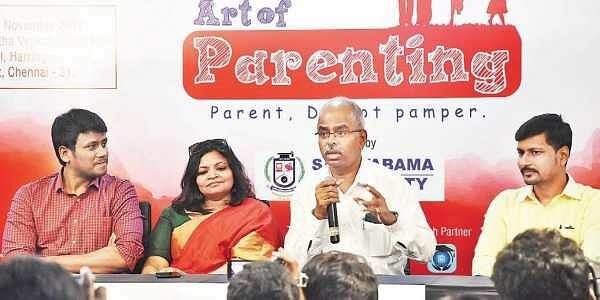 The events will be segregated in three different segments — a stand-up comedy on parenting, a debate between parents and children which will be moderated by Maria Zeena, Pro-Chancellor Sathyabhama University and a talk show involving a set of parents who have successfully practiced positive parenting. “Knowingly or unknowingly there is a lot of pressure on the children, most of the time. And there is no proper institute to guide parents. When a child is born, a parent is born and every child is different. So this programme is initiated to bring parents under one roof and to create a community of like-minded parents. It is not a teaching forum, but is an experience sharing forum” elucidates Deepa Aathreya, Founder and CEO, School of Success. Highlighting the role of parents in a child’s life and recalling his own experience of becoming a successful businessman, Velumani, CEO, Thyrocare, said “I left to Bombay with `500 in my pocket and today my company brings in `500 million dollars. The reason for me being so successful is that my parents did not do anything out of their way for me, and I am proud of that.” The organisers aim to take the workshop to great heights and plan to take it to other cities such as Coimbatore, Trichy, Madurai etc. Rajesh Sanghvi, co-founder of SchoolConnect.in was also present at the event and extended his support and appreciation for the initiative as well.